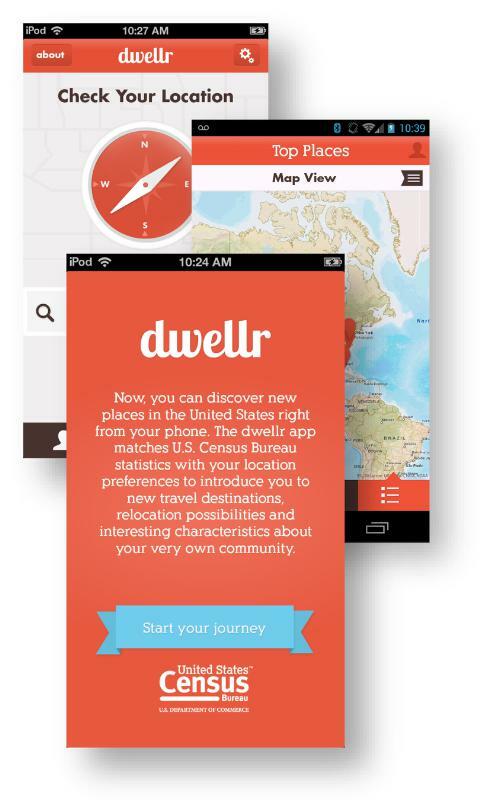 Census statistics are now just a swipe away, as the U.S. Census Bureau has organized its data into a free mobile-accessible, location-based app available today on iPhone(s aapl) and Android(s goog). Other demographic variables like race and age. That information is then consolidated into two different discovery sections: “My Community” and “My Ideal Place.” The former utilizes geolocation to provide information on the surrounding area from the most recent census report. The latter is arguably the most interesting feature, inviting the user to take a short quiz, and then compiles a short list of communities that meet those criteria. It’s an interesting resource for those looking to change communities or move to different cities, and it does a smart job of not overwhelming the results list — users can even organize the top choices by distance to see how far away their dream community really is. The app is an intriguing download, but not one with any lasting utility for the average user. However, data and sociology nerds will sure get a kick out of the census data, especially the differences between urban, suburban, and rural environments. It’s great to see the U.S. Census Bureau embracing the mobile movement and providing easy access to the data it collects.